To some, the end of summer means the end of a crazy mowing schedule and tireless evenings tending to the lawn. However, it’s the PERFECT time to give your lawn some added attention, so that it will be ready to shine when spring arrives. Check out these 4 tips from Spartan Mower on getting your lawn in order and ready to take on the winter. As we head into the early stages of autumn, all of nature’s animals are busy gathering food and necessary items they will need before cooler weather arrives. They are not alone. Your lawn also uses this time to prepare for the frosty temperatures coming its way. What can you do to help your lawn prepare? It’s very important to keep mowing your lawn during the fall season. The key to mowing during this time is to gradually lower your blades until you have trimmed no more than one-third of the length of your grass. This will allow more sunlight to hit the grass during colder temperatures, and there will be less grass to turn brown. 2. Remove Fallen Leaves ASAP! Whether you are raking, mulching, or using your mower to bag fallen leaves, it is very important that you remove leaves from your lawn on a regular basis. There are many people out there who believe in waiting for most or all of the leaves to fall to the ground before removing them. However, this is devastating for the lawn because the accumulating leaves create a barrier on top and end up suffocating the grass below. Check out the Spartan Shield! It allows the operator to control the amount of discharge from the chute with a push button actuator control. Control your clippings and increase safety from randomly discharged objects. Depending on the type of grass you have, fertilizing in the fall could be the way to go in order to have strong and beautiful grass growing in the spring. Applying a fertilizer before winter, allows your grass to absorb much-needed nutrients to brave the colder months ahead. If weeds have been an ongoing nuisance this year, then the fall is the perfect time to fight back. Just like the grass on your lawn, weeds to are preparing for colder months ahead by absorbing as much as possible. Why not give the weeds a little weed killer to quench their thirst? Make sure you read all labels and instructions on the product you choose before applying it to your lawn. Creating the lawn of your dreams isn’t impossible. With a few tips and a schedule that works for you, your lawn will remain healthy and produce a lawn to be proud of when spring arrives. Download our Spartan Mowing Guide today to learn more about creating the perfect lawn. 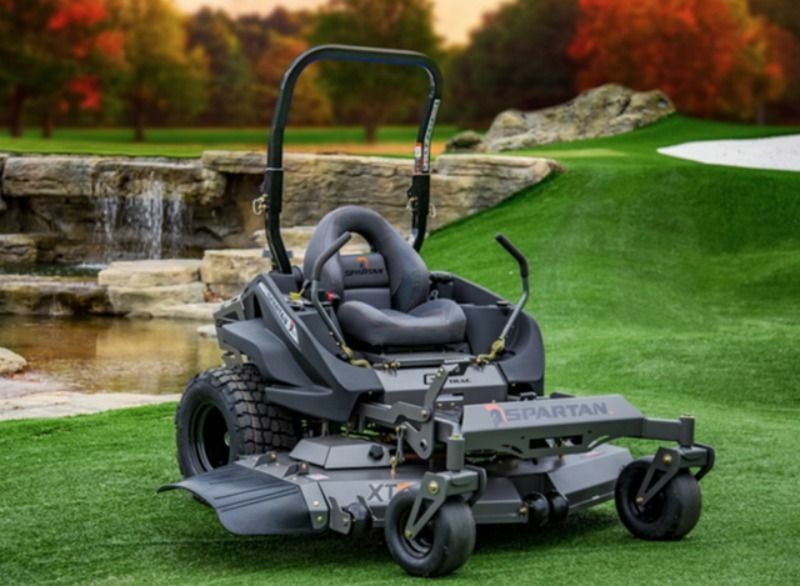 Want to test drive a Spartan Mower? Find a dealer near you by going to our website at www.spartanmowers.com. While you’re there, check out the specs on our RT and SRT Series and find the one that is right for you. You can even Build Your Own Spartan for a more customized machine.